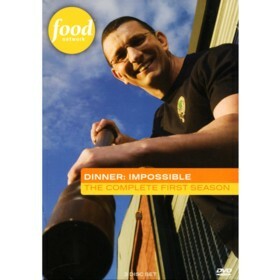 Dinner: Impossible is a television show in the Cooking genre starring Robert Irvine and Michael Symon. The tv show first appeared on air on 2007-01-24. Our users found the overall impression of this television show to be Exciting. The tv show's official site can be found at www.foodnetwork.com/dinner-impossible/index.html. This show is very entertaining, and the cast and crew really make it shine. You will be laughing at least once a show as various people and surprise challenges drive Irvine crazy. Always something goes wrong during a challenge, and somehow the chef manages to pull off the dinner to completion a lot of the time (He does fail a few missions). This really is a great series and I hope he makes more episodes once his current show is over. The visuals and sound are quite good and the music is pretty nice as well...although I don't think you will be watching a cooking show to listen to the music ha ha.